Perfect for a lazy breakfast or as an afternoon treat: These protein-packed coconut flour waffles are gluten free, sugar free and low carb. Paleo option! Do you know those days when only a waffle will do? A soft, light and fluffy waffle with a gentle crunch on the edges, preferably straight from the waffle maker so it’s still warm? A waffle that fills the kitchen with the most mouthwatering smell of baked deliciousness? When I look out of the window, I can say with 100% certainty that today is a grain free waffles day. One of my favourite waffle recipes are these low carb waffles, which disappear faster than you can say waffle. These babies come out of the waffle maker, hover in the air for a second and are gobbled up before they even reach a plate. Friends, low carb waffles have got some serious competition: the almond butter coconut flour waffle! 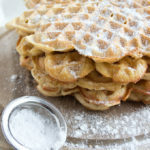 Almond butter coconut flour waffles are the heartier cousin of regular low carb waffles. Purists make almond butter waffles with only almond butter, baking powder and eggs plus a sweetener such as banana or my favourite, erythritol. But I have a hungry teen in the house so that just won’t do. Have you got any idea how much teenagers eat? They wake up in the morning so starved they can hardly get out of bed. Feeding teens is like throwing food into an abyss. That’s why my almond butter waffles include coconut flour, which is not only crazy healthy, but adds more substance (read: they are filling!) and turns it into a veritable meal. 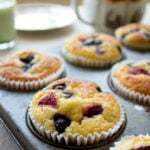 Coconut flour is gluten-free, particularly rich in fibre and low in carbohydrates. I love baking with it, though it can take a little to get used to it. Coconut flour absorbs a LOT of liquid. I have experimented quite a bit with this recipe and finally cracked the ideal ratio of wet and dry ingredients. 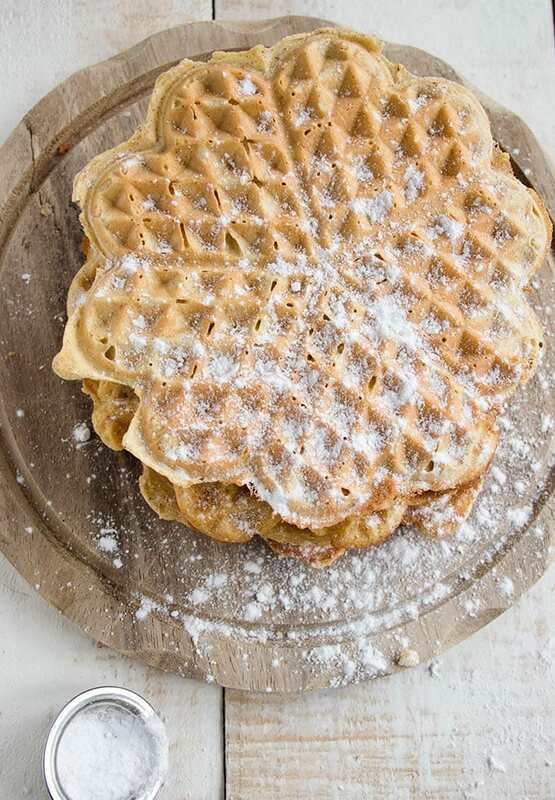 The result is light, moist and fluffy waffle heaven with a fragrant almond note. Basically, a brilliant lazy breakfast or snack for hungry kids. These waffles are easily customisable. You could use peanut butter instead of almond butter and experience with spices by adding mixed spice (AKA pumpkin spice in the US) or cinnamon for a more festive flavour. 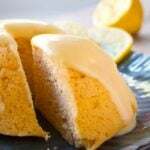 If you prefer to make your own baking powder (most store bought varieties contain aluminium and corn – read this article on All Natural Ideas about how to make your own). In terms of toppings, I am a purist – I have just dusted my stack with powdered erythritol. Feel free to enjoy your waffles with creme fraiche or whipped cream, a sugar free caramel sauce or some berries. If you do not have a waffle maker, you can use the dough to make pancakes instead. My recipe makes six waffles. Should your house be teen-less, you’ll be glad to know that almond butter waffles keep well in the fridge. Just toast them gently or warm them up in the microwave the next day. These fluffy coconut flour waffles contain almond butter, which makes them extra moist and yummy. 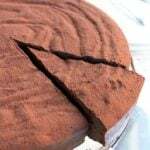 Sugar free, gluten free, low carb and suitable for diabetics. Separate your eggs. Start by whisking the egg whites until they are firm and form stiff peaks. You have to use a clean, non-greasy bowl for this and be a bit patient. In a second bowl, mix all the other ingredients until the batter is nice and smooth. Gently fold spoons of the whisked egg whites into the batter. Try to keep as much of the air and fluffiness as possible. Let the batter sit for a few minutes to let the coconut flour absorb the moisture. Don't forget to grease your waffle maker before you get going. 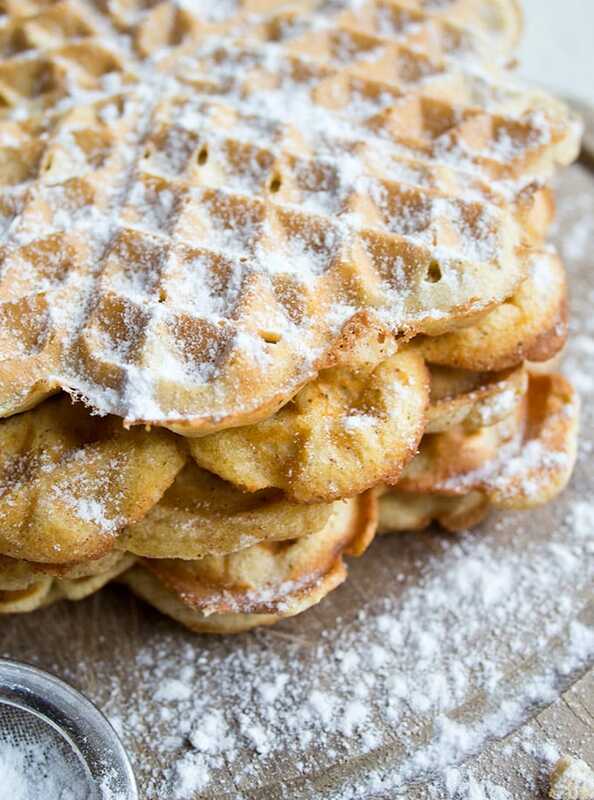 Grain free waffles have a more delicate consistency than wheat waffles, so take care when removing them. Bake your waffles until nice and golden. With a waffle maker that makes heart shaped waffles, you should be able to make 6 fine specimen. I love my heart shaped waffle maker because it makes the waffles thin and crispy, which is how I like them best. You can make them with a square waffle iron as shown in the video - that way they will be thicker and softer. Love this recipe! Definitely my go to. What would happen if I made muffins out of those? Any idea how long to bake and on what temp? Thanks! Hi Ilana, I’d try 180 Celsius and probably 20-25 minutes until they are golden brown on top and a knife inserted comes out clean. 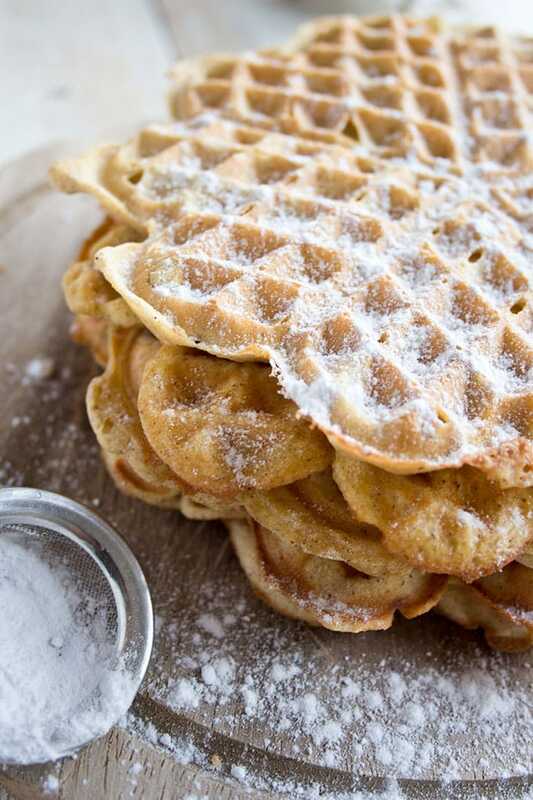 Are these waffle crispy? I find so many low carb waffles are limp. I’m looking for a low carb waffle that has that scraping noise when you move your fork over it. I find this really depends on the type of waffle maker you use. When I used the round waffle iron that produced the heart-shaped waffles they were crispy. The square waffle iron makes thicker waffles and they ended up being softer. I made these and loved them. Thank you for the recipe. Oh dear! I”m sorry about this – I tried it out and you’re right, it appears the recipe plugin can only change the first amount and not the second. I’ll have to see if anything can be done about this. I have changed it around in this recipe for you, so the US cups show first. Thank you for pointing this out. Omg this was so yummy. I just made it and two of them Although I don’t have a heart waffle maker I just have a regular one the makes them round. I added cinnamon, ginger spice, pumpkin spice and my favorite coconut almond butter it was just heaven. can you add pumpkin for pumpkin spice waffles? That sounds like a great idea!!!! Hiya, I wondered if you used large or medium sized eggs? Hi Staci, most of the time I get my eggs from the farmer and they’re mixed. This recipe has been made by many people now, and I think we can safely say that both medium and large work. The only thing I’d suggest would be that if you dislike tasting egg (some people do) AND you’re using large eggs, you could try use 1 egg yolk less. I hope that helps! Would this recipe work with heavy cream instead of milk? I’m sure it would work well. You’d keep the same wet/dry ratio! Can you freeze these waffles? I think that should be no problem. 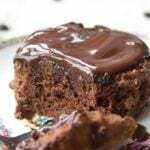 I have frozen cakes made with nut flours before and almond butter itself is freezable too. Katrin, I did freeze them and I just ate mine. They were still delicious. So happy I found this recipe. One of my new favorites. Thank you for the quick response. Just got done making these waffles. They are delicious. I was a little confused because in the recipe it said to fold the egg whites into the egg yolks. I thought maybe this was an error and I choose to fold them into the batter leaving out the yolks and they were wonderful.Can you please clarify this for me? I also added Lily’s sugar free chocolate chips and almond silvers. Very filling. Hi Paula, I’m glad you like the waffles! 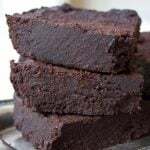 And thanks for your comment – you are right, the way I described it was maybe a bit unclear – of course the egg whites are folded into the batter at the very end. I have changed it in the recipe description. 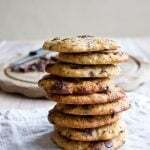 Adding chocolate chips sounds like a great idea!!! How many waffles are a serving one or two? Hi Loretta, I calculated the recipe at 6 servings, using another waffle maker which makes round waffles that separate into 5 pieces. You can see them in the photos on my blog. For me, one of these was enough – the almond butter and the nut flour makes them quite filling. So the nutrition info I calculated was for one of these waffles. I’ll definitely be making this recipe! Thanks! Awesome. Glad you found my page. I don’t fare well with dairy. Any suggestions on an alternative? You could use coconut oil instead of the butter. Can you recommend a specific brand of creamy almond butter? My kiddos hate “bits” and I can never seem to get things smooth or creamy enough for them. Thanks! Hi, if you are based in the UK I can – I like the Meridian brand. They have awesome nut butters with no added extras. I’m sorry to hear you’ve been diagnosed – but from what I’ve read you can completely reverse Type 2 Diabetes with a low carb diet. I’m glad you have found my site and hope you will enjoy my recipes. Good to have you here!! These were amazing! They turned out like the picture 🙂 Thank you for sharing. These look fantastic! I am such a lazy baker/cook though. Would it mess these up if I didn’t wisk the egg whites separately? Can I use the egg whites from the carton? I normally prefer to just dump everything in together and mix away! 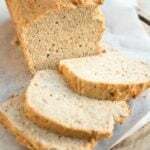 It would work, and still taste good, but the texture would be different – less fluffy and denser. I used to think whisking egg whites was an impossible task, so I have made waffles (not this recipe though) without whisking the egg whites first. I have to say though, it really is worth the effort…really transforms it! 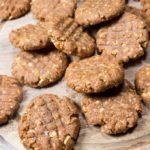 I have another recipe, these Hazelnut Keto cookies, which I also have made both with and without whisking the egg whites… the difference in texture is staggering. Can’t tell you how much my husband and I loved this recipe. I followed it to the ‘T’ including whipping the eggs to standing peaks. The waffles had the lightness of a butterfly; so different from those made from wheat flour. While surfing your site I was impressed with your knowledge of the effects of each ingredient on diabetes. As a pre-diabetic with a history of the disease in the family, I’m trying the Paleo Diet. It’s worked out very well for me and I’ll look to your recipes for sound advice in implementing my new way of eating. Thanks so much for the help! This looks delicious but I’m allergic to coconut sadly. how would you modify or substitute? These were really good. I made them with peanut butter instead of the almond butter and added sugar free chocolate chips. I will definitely make them again. 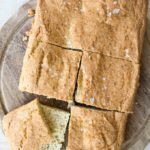 Not used coconut flour before – does it add a coconut flavour? My husband whose gf hates coconut – so wonder if you recommend any other flour (if the coconut gives a strong flavour). My father in law is diabetic so this recipe sounds almost perfect for a cheeky dessert! Can’t wait to try it! We love these waffles! I topped them with blueberries. The flavor reminds me of waffle cone (for ice cream). I could eat them for dessert – they’re so good! My kids approve too. Thank you so much for this awesome recipe!! Awesome. Thanks for your lovely post. So happy you are enjoying the recipe! How many waffles are in a serving size? The nutrition facts are calculated per waffle. One was enough for me. My teenager son ate two. It really depends how hungry you are and what you put on them! Have you ever used this batter to make pancakes? I still can’t find a pancake mix that I like and I know that most people use waffle batter and pancake batter interchangeably. I haven’t made pancakes with this recipe but it would definitely work. Give it a go and let me know what you think! I*m a begginner in LCHF diet, so I still learn. Are apples not forbidden ? Also, we never use baking powder in such large quantities, because the flavor is very strong. Is it possible to reduce this amount? Your pictures come out amazing! You do such a great job! Aaaw, that’s such a nice comment, ToniAnn. Really appreciate it. I just made these. The taste is wonderful. The only alteration I made was to leave out the almond extract. I was worried it would be too almondy. Next time I’ll add a pinch of salt. It tasted like it needed it. The only thing I didn’t like is that they don’t come out crispy. The golden up very good , but no crunch. Will definitely make again!! Glad you liked them Kelley. 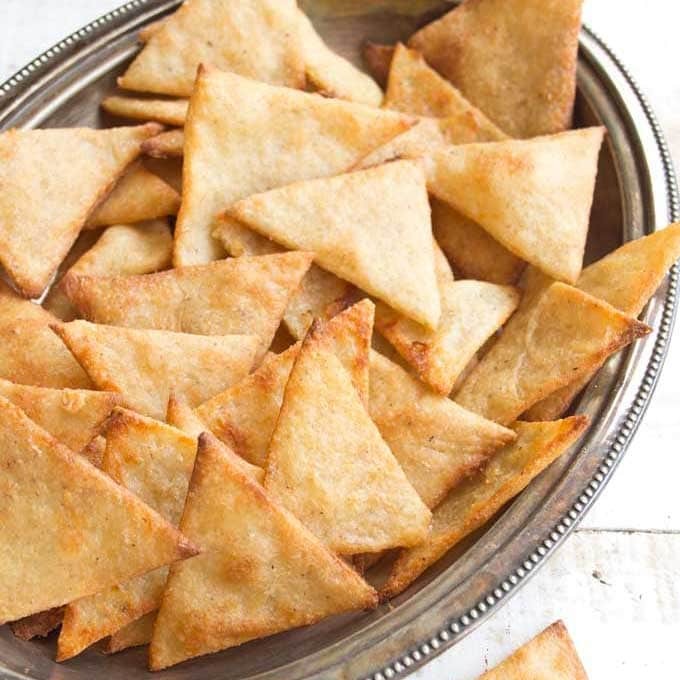 You’ll never get exactly the same crunch you’d get from wheat recipes… Mine did have a satisfying crunch on the edges though. If you have any left, try toasting them. You might find they get crispier that way! I love waffles in all forms. 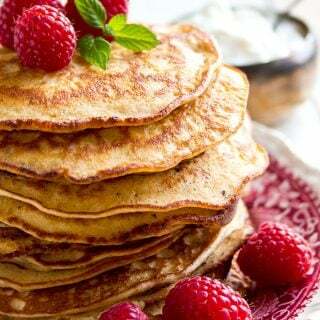 Love to try them with coconut flour sometime! Your waffles look amazing! And I so agree with the addition of the coconut flour (even if we don’t have teenagers in the house 😉 ). Great recipe! Happy New Year, Katrin!! I’m just starting to figure out coconut flour – it’s so different from everything else, isn’t it? This looks like a good recipe to try out and see how it works in that! Yummy. I love waffles and can’t wait to try these! These look so good and I love that they are not full of refined sugars! Glad you like them Safira! Oh, my kids have been asking for waffles and I must make these – especially since you say they are filling! My daughter is a breakfast person and I swear she has enough for two breakfasts. I bet she loves these. And applesauce? Perfect. I have two of those kids at home, LOL! I have hungry teens and collage students at my house. I am continuously buying food, making food, and throwing it into the abyss (I love that analogy, lol). 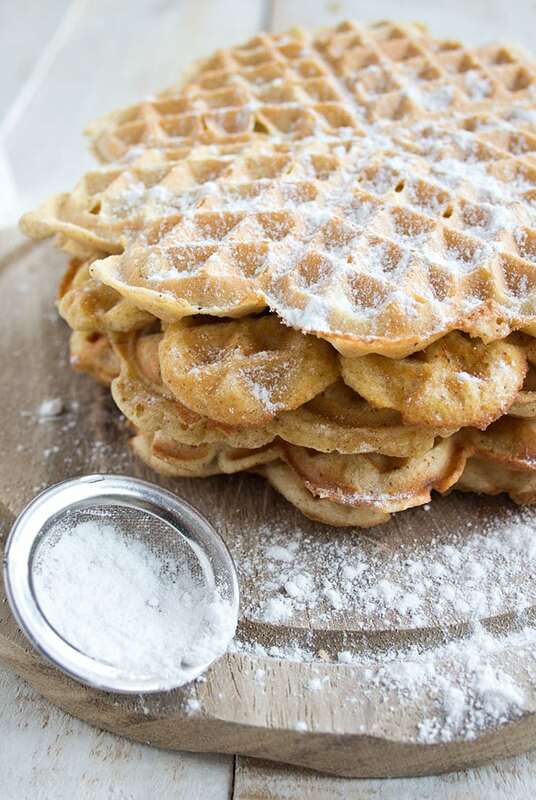 These waffles look filling & tasty, and would keep them out of the kitchen for a couple hours. Isn’t it amazing how much they can eat? These waffles look great! I love putting homemade applesauce on mine.